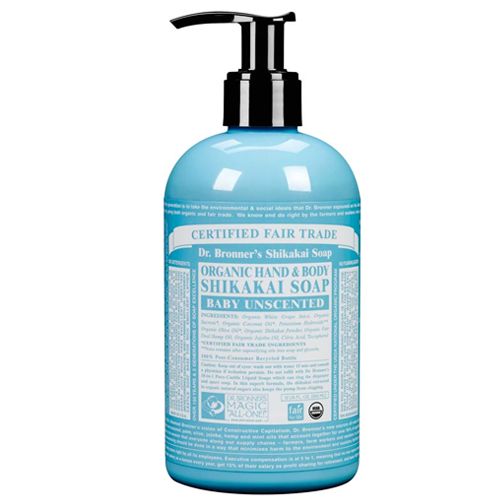 Dr Bronner`s Organic Unscented Hand & Body Shikakai Soap is smooth and luxurious with no synthetic detergents. Organic Shikakai comes from the seed pods of the small South Asian tree Acadia Concinna and has been used for millennia in India as a gentle conditioning cleanser for both skin and hair. Dr Bronner extracts the Shikakai from organic sugar and grape juice then combines it with Dr. Bronner`s unsurpassed castile soap base for a rich emollient lather and moisturising after-feel. Organic White Grape Juice, Organic Sucrose*, Organic Coconut Oil*, Potassium Hydroxide**, Organic Olive Oil*, Organic Shikakai Powder, Organic Hemp Oil, Organic Jojoba Oil, Citric Acid, Tocopherol. Apply a generous amount to moist hands and lather up all over the body. Below are reviews of Dr Bronner`s Organic Unscented Hand & Body Shikakai Soap 355ml by bodykind customers. If you have tried this product we'd love to hear what you think so please leave a review. Dr Bronner`s Organic Unscented Hand & Body Shikakai Soap is smooth and luxurious with no synthetic detergents. Organic Shikakai comes from the seed pods of the small South Asian tree Acadia Concinna and has been used for millennia in India.